Stella Arnaldo's Blogspot: Merry Christmas people! More importantly though, it's amazing that most of us are still on our feet. We still have our jobs, the love of family and friends, have a roof over our heads and can still eat three basic meals a day. Many of us are still relatively healthy, dear readers. Forget all the petty annoyances and insignificant idiots who sometimes make life hell for us. Let's just be grateful for being able to wake up each morning and getting up on our feet. And getting on w/ our lives. Woo-hoo! 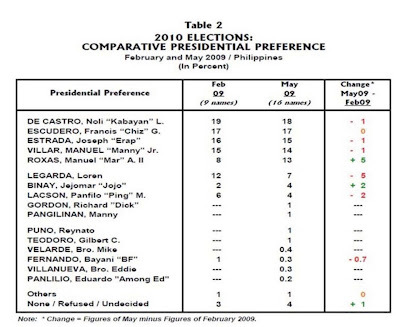 Just read this on the news: The runup to the presidential elections in 2010 sure looks tight if you read the latest survey of Pulse Asia. Most remarkable of all is MAR Roxas, formerly a kulelat, is now among the top 5 candidates, after gaining 5 points since the Feb. 2009 survey. Would it be the Korina factor you think? Ooh, if this keeps up, I see a wedding by December. Joke! Seriously, I think I'll take Korina over Nikki Teodoro anytime. The Defense Secretary, btw, is hardly rating. Then again, it's less than 11 months to presidential elections. Anything can still happen between now and May 11, 2008. To be frank though, even if Gilbert Teodoro does do an FVR (i.e. form his own party, as his wife has threatened, ugh) if PaLaKa, the administration party, doesn't nominate him as its presidential standard bearer, I think he lacks the political savvy, charm, and connections of the old man. You may recall that FVR had been around the political universe even during Marcos' time w/c allowed him to tap those old powerful networks when he ran in 1992. Teodoro has hardly the financial muscle and TV face time like his 2010 rivals, who've been hogging the headlines and airtime far longer than him. If only he can get his Tito Danding to drop Chiz Escudero, who really is much too young (not to mention, overmemorized) to be leading this country, then Teodoro has a larger chance to make the rest of the country know him a bit better. Other than that, I wish the opposition can just get their act together and agree on one common candidate. It's the only way to defeat the PaLaKa/administration candidate, whoever it may be. It's time these guys think about the country for once, instead of furthering their own petty interests. Yun na! AY, hindi pa pala. 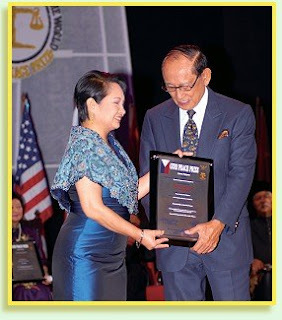 How true is that FVR and the presidentita already kissed and made up? And over glasses of cognac? Click here. Well, should we have expected something more respectable from our 'elder statesman'? Ugh. i hope we will have a gay president in 2010 so we don't have to worry about misbehavin' first ladies/gentlemen..not to mention children who just want to become artistas..using malacanang as the launching pad of their careers...d va ziz? E umuwi ka nalang kaya at mag-file ng candidacy mo? I will be your campaign manager. Lahat ng volunteers kukunin natin sa Padi's Point sa Malate. hahaha!